This article is presented by Five Ultimate; all opinions are those of the author. Please support the brands that make Ultiworld possible and shop at Five Ultimate! This article includes contributions from handlers Tim Fergus and Jimmy Wiesbrock. Handlers operate in smaller spaces and smaller stall windows than cutters, yet have much larger pressure on them to get open. With generally only three players slotting in to play this throwing-heavy position, it often becomes critical that a team’s handlers can get open to reset the disc, especially if the offense downfield is stagnant or the stall is high. Whether it is through dump, swing, or upline movement, handlers need to be dynamic: both quick on their feet and in their decision-making. Hesitation can cost just as much as a bad cut; a great handler needs to avoid both. Here are five handler moves guaranteed to get you open. Description: Turn a defender’s hips and you almost always gain two steps on them. For a handler, two steps is almost always enough to get you open. Set up at a 45 degree angle, about ten yards away from the disc; this works either on the open or break side, but is especially effective on the open side, when the defender really lacks any protection from the mark. Often, a defender will either face guard or play some kind of aggressive backfield defense, trusting the mark to make the upfield (hardest) throw difficult. Take three hard steps directly towards the defender, attacking one key shoulder. If the defender is square to you, you have your choice, but if the defense is angled, aim for the outside (away from the disc) shoulder of your mark. Your defender will either backpedal or begin to turn the shoulder to the side you’ve chosen, instinctively reacting to your movement. Either way, you’ve gained a step, bringing the defender in closer and giving him or her less reaction time. After closing the distance, attack upfield (always the most dangerous) for a few hard steps, forcing your defender to turn completely out of defensive position. Immediately cut off the angle, plant hard and change direction, sinking back to go behind the thrower for a wide open swing. Description: Many players feel the need to really show their speed or footwork to get open cutting upfield for a strike from the breakside. In reality, if a defender is smart and at all determined (playing good upfield position), getting open up the line is going to be extremely difficult no matter how fast you move or cut. Oftentimes, such effort leads to dancing, not only ensuring you won’t be open, but cutting off your teammates’ chances at getting the disc. The best way to get open for a strike is to lure the defense out of position. This can be done through a series of cuts, but works best in another way. Somewhat passively, hang back about ten yards away from the disc on the break side; lead your mark closer to you by slowly drifting further backwards seemingly hoping for a break swing to go off from your thrower. You are baiting the defender, hoping he or she either gets so worried about this theoretical swing that they get very close to you (out of their downfield cushion of safety) or turn their head to check what’s going on with their mark. Should either of those two things happen, you must spring into action and quit playing possum. Bust hard two steps at an angle backfield, as if to create even more separation for that breakside swing. If your defender has truly bitten, they will follow (often without thinking) and then you have your chance to dip inside at a sharp angle and speed upfield. By the time the defense turns, you are wide open. If the defender didn’t bite, or retreated at all, it will come down to a footrace (one that you may not win, but at least you’ll have cleared space for another handler to fill). A nice twist on this move can be done on the open side for an inside out “hardest” throw, especially deadly. Another great variation of this is doing a similar motion at the front of a vertical stack. If for some reason the person with the disc is looking reset (maybe a swing has happened or another handler has cleared), start heading back towards the logical next move, a breakside swing continuation. Your mark knows this is the logical course and will follow intently, hoping to get the block, only to discover you only took two hard steps that way to head the unconventional direction (upfield for the strike). Description: The backfield is not the only play area of the handlers. Going downfield can not only throw the defense off guard, but really lead to some crushing offensive flow. On the breakside, in typical reset position, almost everyone expects a traditional 45 degree angle for a strike cut or a breakside swing to occur. Defy convention by heading straight downfield. Your defender will react, but will often be confused, unsure of whether you’re headed for a surprise huck run. Sometimes heading for that deep run (whether from the active or secondary handler spot) will cause defensive switches or a complete separation, allowing you to get open for a continuation pass in a few moments. But for an even better move, take control by breaking the cut off at 5-10 yards, heading for a direct sideline route (if the lane is clear) at 90 degrees. You’ll either be open for an upline power position throw, or have a chance to really stretch your legs and set up yourself for a continue in a few passes. Description: The give and go is, in many ways, the best weapon of the handler. Quick passes followed by quick feet can completely open up the field for all the players: defenses are out of position as the disc moves all over the field, the force is rarely held, and sometimes one or two players can isolate, and then win, their matchups to eat up large swathes of field space. The best give-and-go’s revolve around the open side handler. One of the best moves to create this option is to dive down for what seems like a relatively simple and ineffective dump or swing. Setting up on the open side, use the same initial moves of the “Shoulder Attack.” Drive upfield at a defender’s shoulder, forcing them to turn hips or retreat back to protect the I/O, but you are only faking to create more space in the backfield. This is particularly effective as a secondary option when you have a difficult and aggressive defender who might be hard to shake or might have a shot to lay out a more initially pleasing centering swing. Instead of dropping back for that swing, cut hard back at a reverse 45 degree angle, heading to further back behind the disc for a dump. This should be an easy dump as the thrower turns his or her back to the mark and makes the pass. This is where coordination (and often pre-planning of handler resets) are needed. 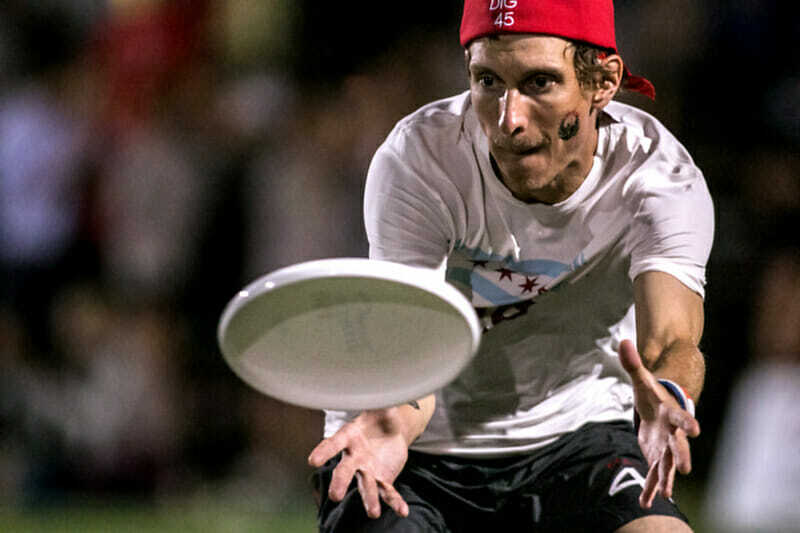 The handler throwing the disc should not clear upfield and should not turn away, but instead use his or her first steps to streak towards the center of the field, and should immediately hit a leading swing in that direction. As that player (original thrower) gets the disc back in the middle of the field, they have a lot of options, but one can be yet another give-and-go, this time from the original reset handler streaking upline for a power position cut. He or she just threw that centering swing and has great vision of what is happening upfield and in the open lane, should they cut that way. This often easy strike will still likely be in the center of the field and have even more options, with a possible one to two stalls before there is even a mark. This series of cuts, while simple, can be extremely tiring and displeasing for defenders who are often chasing, barely setting up a mark, and then having to chase again after a stall one throw. Remember, successful give-and-go’s don’t necessarily happen because of a blazing first step or top speed, but because of the ability to first move the mark away from where a handler is planning to throw, and then to cut upline immediately after release (while the mark is still moving that other way), gaining not only space, but a few steps because of the lag in reaction time. Description: Sometimes, less is more. Have you ever heard a handler tell another handler to “do less?” Often, if handlers are too focused on their moves or cuts, they get into a mode of quick dancing that doesn’t get them open, or overly aggressive cuts that may be available, but are timed incorrectly. This is a reminder that patience and timing are extremely important and that throws are often the handler’s biggest strength. The sink and sit relies on high chemistry between two players that can accurately read a defense. It also requires throwers that can break the mark. Setting up in traditional reset position, don’t actively cut for the first few stalls, but let the downfield work while you read the defense. This is ideal if you have been given a cushion, or even better are aggressively face-guarded. Either of these opposite scenarios leaves the defense exposed. See the defense and make eye contact with your thrower, then allow the thrower to dictate, either hitting you in open space or throwing into a narrow window where you can run on to the disc before the defender is prepared. These can be deadly, especially if a face-guarded defender is suddenly burned on a skinny break, leaving a good handler completely without a mark. Again, these require chemistry and usually a handler-to-handler connection (most cutters, especially those without great throws, simply hate having a handler stand and look at them). Bad turnovers can result from these types of throws, especially if the reset suddenly makes an unexpected move. Commit to the idea if you choose this route; let the thrower move you with his or her fakes and throws, and drive the defense crazy by forcing a mark to keep turning his or her head. Once you’ve employed one of these moves to get the disc, it is up to you to direct the continued offense. Remember, like a general on the field, sometimes you’ll be more about organizing an attack, rather than participating in it. Other times, you’ll be the one doing the heavy lifting, either through throwing or cutting, and defenses will be sure to notice you. Regardless, don’t just focus on using one of these moves and getting open, but be sure to know what you plan to do with the disc, once you have received the pass. Use these moves and you’ll be sure to have that control much more often. Don’t miss the five cutter moves guaranteed to get you open! And be sure to check out more of our Tuesday Tips to improve your game. Comments on "Tuesday Tips: 5 Handler Moves Guaranteed To Get You Open, Presented By Five Ultimate"